How does teacher education contribute to the learning outcomes of future teachers? Are there programs that are more successful than others in helping teachers learn to teach? How do local and national policy environments contribute to teacher education outcomes? This chapter introduces the book to readers and invites them to explore these questions across a large number of settings. The chapter illustrates why investigating the impact of pre-service teacher education on teachers’ learning outcomes is a necessary component to understanding variation in the quality of teachers who enter the field. 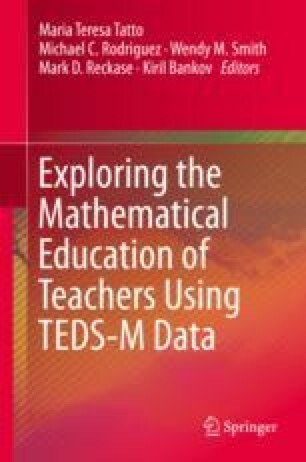 The chapter also provides an overview of the Teacher Education and Development Study in Mathematics (TEDS-M) a cross-national study of primary and secondary mathematics teacher education sponsored by the International Association for the Evaluation of Educational Achievement (IEA), and funded by the U.S. National Science Foundation and participating countries. The book includes original work that explores new facets of the TEDS-M methodology and data, along with results and policy implications; and illustrates the challenges and possibilities in engaging in systematic research on teacher education. Because we lack models to frame research on teacher education processes and outcomes, the book seeks to provide guidance to future research in this area by outlining the methodology followed by the TEDS-M study as well as findings from secondary analyses of the rich TEDS-M database. The text in this Overview contains shortened and slightly edited versions of text that has appeared in the following publications: Tatto et al. (2008). Teacher Education and Development Study in Mathematics (TEDS-M): Conceptual framework . Amsterdam, the Netherlands: International Association for the Evaluation of Student Achievement, and Tatto et al. (2012). Policy, Practice, and Readiness to Teach Primary and Secondary Mathematics in 17 Countries. Findings from the IEA Teacher Education and Development Study in Mathematics (TEDS-M ). Amsterdam, the Netherlands: International Association for the Evaluation of Student Achievement. Text cited directly or indirectly from those sources will not be made recognizable. An extensive report on the descriptive findings on the characteristics of teacher education programs and teacher educators in the study can be found in Tatto et al. (2012), and in Tatto (2013). We summarize the key concepts and findings here to orient the reader; the chapters in this part however are original contributions written exclusively for this book.